Since moving to Tenterfield I’ve met lots of lovely ladies, who have made me feel sooooo welcome. Two are having birthdays this month, so I’ve been busy creating and I really cannot put this set down for very long. The ‘friends’ image is so perfect to not only thank these girls for their warm welcome to me but to also wish them a Very Happy Birthday. This card has a really interesting background. I inked the roller that is in the Autumn/Winter Mini,Very Vintage, with Versamark ink and then rolled it onto white gloss paper. I then allowed it to dry for some hours then took my brayer and rolled out rose red and then pink piroutte, and then allowed the inks to blend into each other. The image above looses something in the photography. It’s quite a strikingly different effect (…..and fun too!) I then distressed the edges of the layers around the ‘F’ image ad sponged them. The branch is from the new Two Step Bird punch, also in the Autumn/Winter mini. I really enjoyed making this card and it’s so ‘pretty’. So what do you think? Please leave me a comment to let me know. Wow Nanny you are fantastic love the birthday card. “Wow” is all I can say! I just love this card Jacqui…..and dang, now I have to get that wheel!! 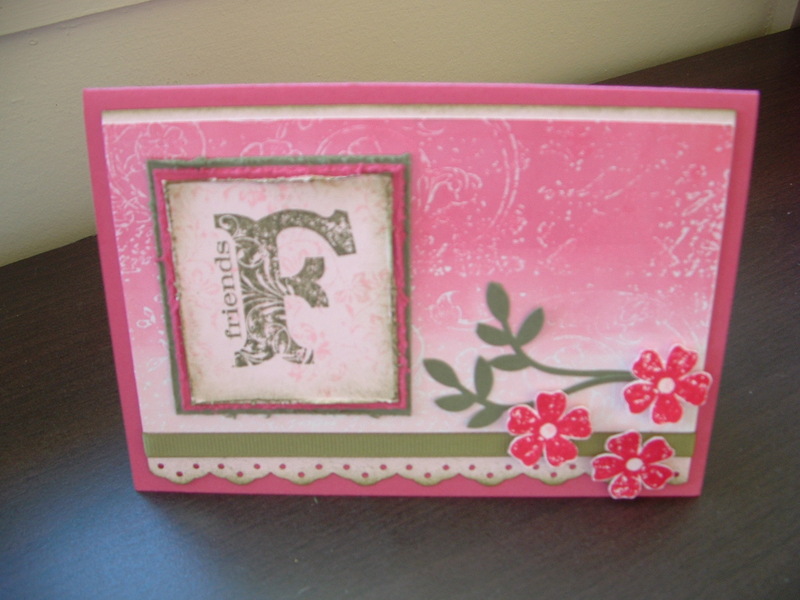 Lovely technique Jacqui – I’m going to put this card in my CASE file to have a go. Love love love the christmas cards with Autumn Days – to think that I could do without that set… silly me!